Among the most visited historical sites in Normandy are the cemeteries for fallen warriors of the D-Day landings and subsequent battles. 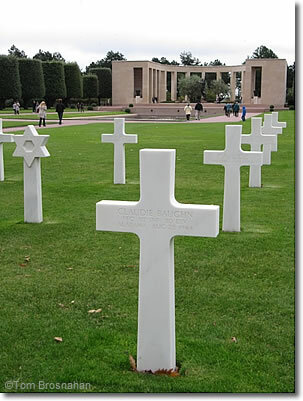 The Bayeux Commonwealth War Graves Commission Cemetery on the outskirts of Bayeux off the D5 highway (map) is the largest World War II cemetery for Commonwealth soldiers in France, with 4,648 Commonwealth burials, and 466 German burials. The Bény-sur-Mer Canadian War Cemetery holds the remains of 2,044 Canadian soldiers as well as one French and three British soldiers. Beautifully maintained, with abundant flowers in summer, it is located in fertile country near Reviers, due south of Juno Beach (map). The La Cambe German War Cemetery, Friedenpark, or Peace Park, is on the site of a previous American war cemetery. The 21,222 burials here are of German soldiers who fell in many battles in Normandy. Many had been buried elswewhere, but were reinterred here after the cemetery's reorganization and inauguration in 1961. The cemetery is located just south of the N13/E46 highway 29 km (18 miles) northwest of Bayeux(map). Normandy American Cemetery and Memorial, Colleville-sur-Mer, Normandy, France.